Macaroni and cheese is my another all time favorite comfort food. 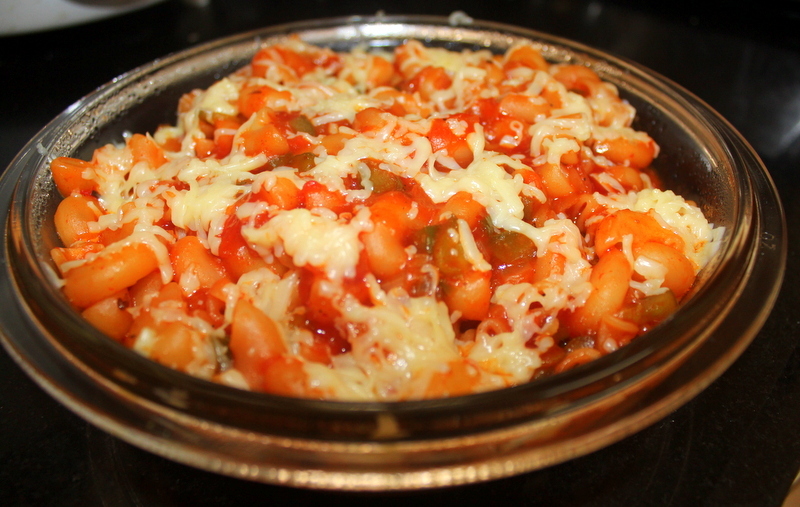 Italians believe macaroni is a mood changer, and I completely agree with that! Kids love this as its not complicated and its a best way to make them eat the veggies they usually don’t like. 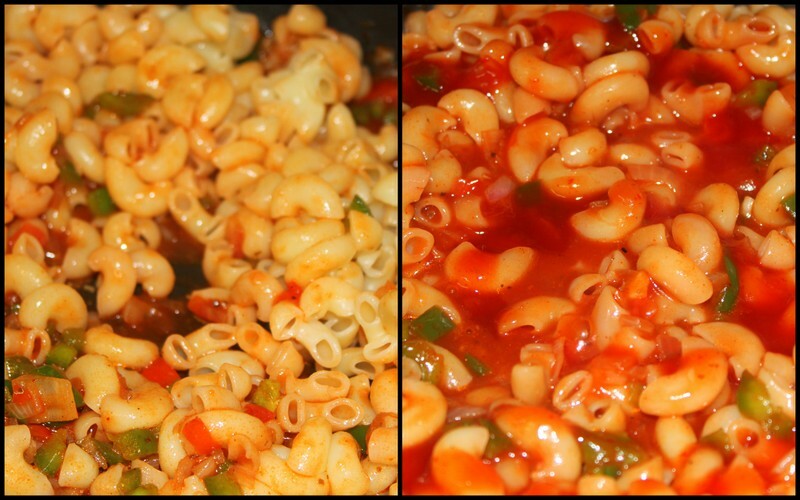 Boil macaroni for 10 mins in hot boiling water and a pinch of salt and keep aside. 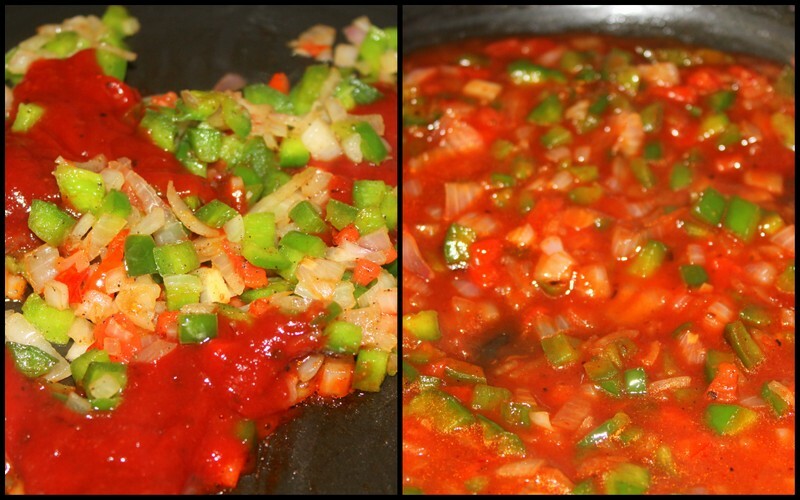 In a non stick pan, add olive oil and the chopped onion, tomatoes seedless and bell pepper. To make it look more colorful you can add yellow and red bell pepper also but remember it can get very spicy so add according to your taste. Once the veggies become soft add the ketchup and 1 cup of water. You can add your choice of ketchup I used the sweet and spicy one. 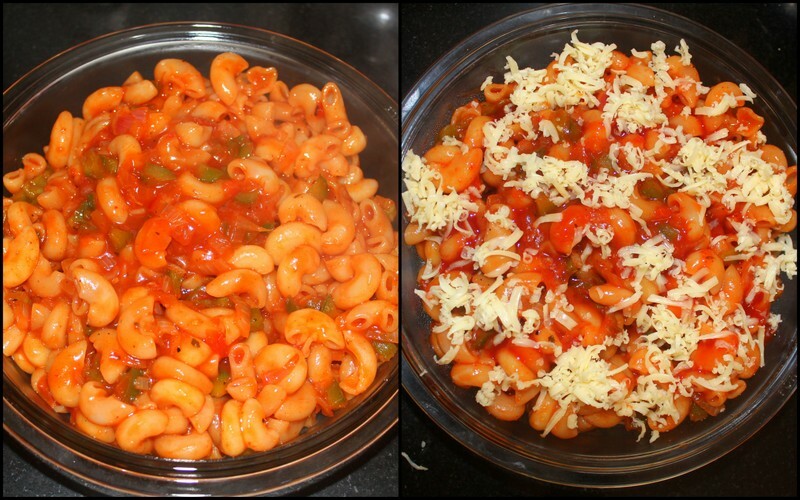 Once the sauce is thickened add cooked macaroni and mix everything thoroughly. Cook on low flame for 5 more minutes and then turn off the flame. 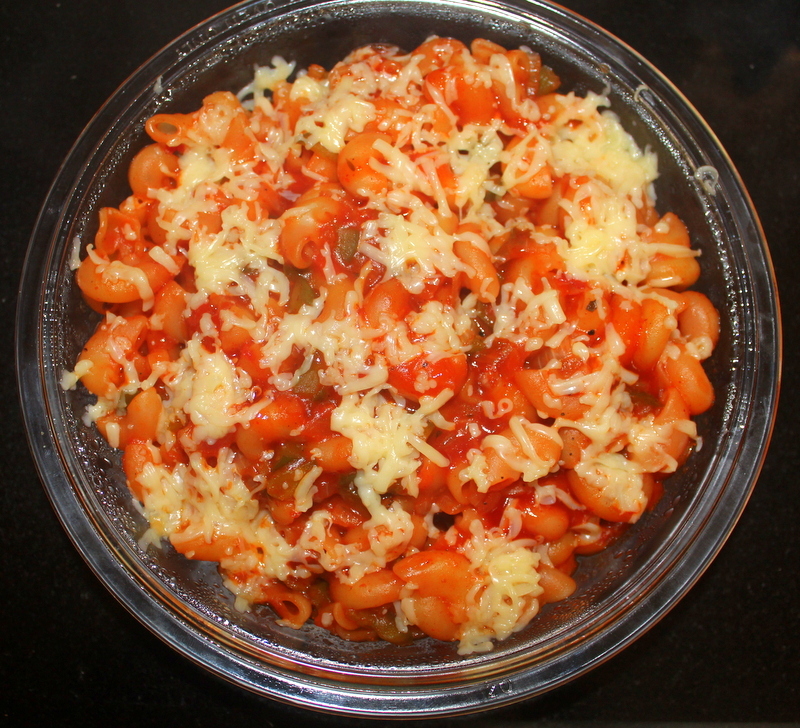 Grease the baking dish and pour over the macaroni, sprinkle the cheese on top and bake in a pre-heated oven at 200 degrees C for 10 mts. Finger licking macaroni is ready!! 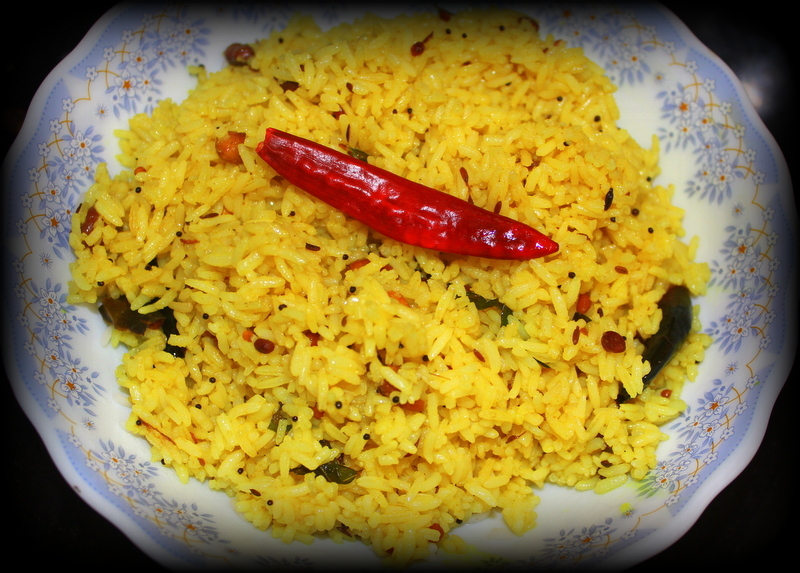 On the occasion of Krishnashtami, I wanted to post our all time favorite prasadam recipe, yumm pulihora. This is an easy and simple recipe and also is ideal to pack for travel as you can keep it for long up to a day, it does not get spoiled. 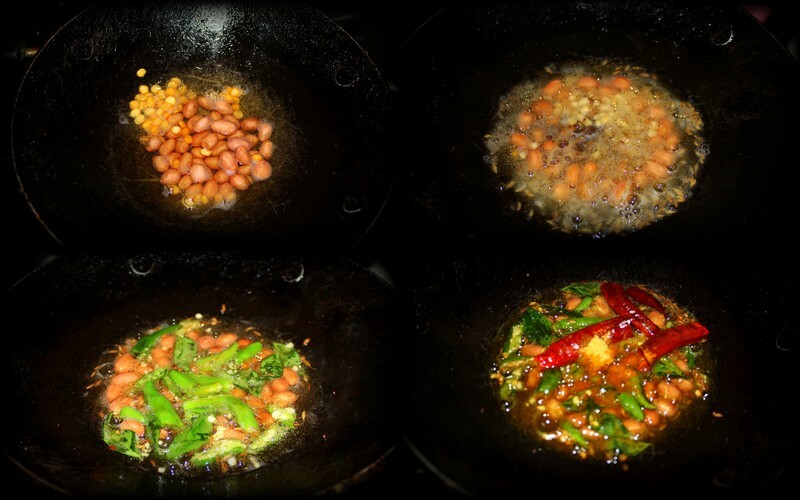 In a small kadai, add oil and fry peanuts and chana dal until they change color. Then add cumin & mustard seeds. When they start to splutter add curry leaves, green chillies and red chillies. Add hing, turmeric, salt and let them fry for a minute. Now add the tamarind juice and cook until it changes into thick consistency. You can add jaggery if you like that twist of sweetness in the rice. Turn of the flame once you have your desired consistency. 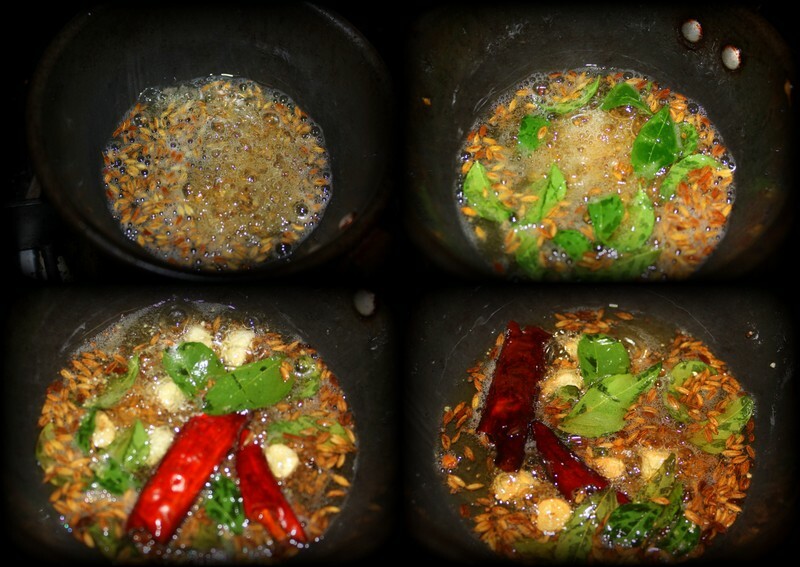 In a big vessel add the tamarind masala on the cooked rice and mix everything together gently. 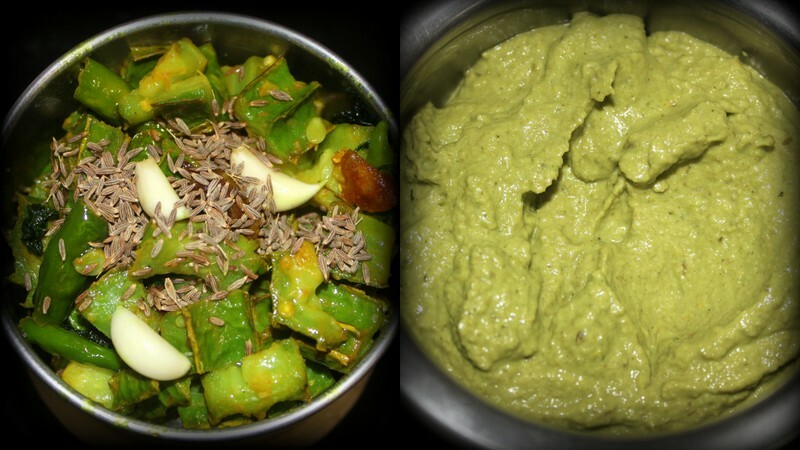 Enjoy pulihora with masala papad! It tastes yumm when its cold. Soak the paneer in water for few seconds, and remove and cut them into fine square pieces. 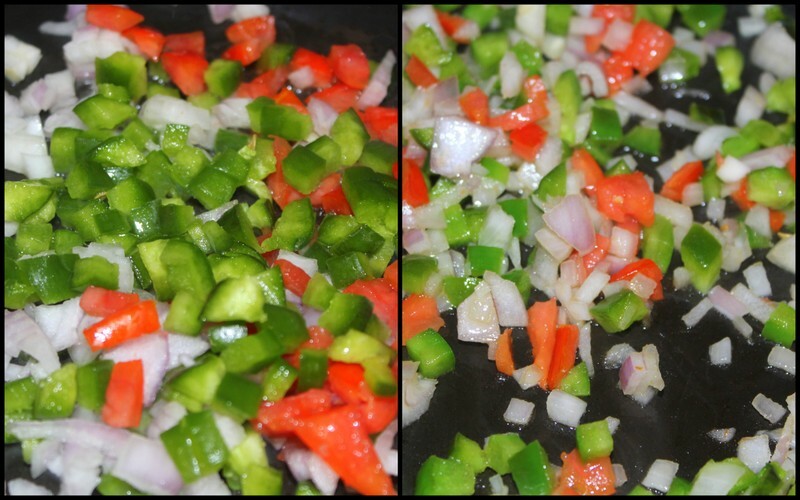 Saute them in oil for few minutes and keep them aside. In a kadai add 1 tsp oil, cinnamon, cardamon and clove, when they start to splutter add finely chopped onion and tomatoes with cashew powder. Let them cook for few minutes untill you see oil appearing on top.Now turn off the stove and and let this masala cool off. In a mixer jar, add the masala and make a fine paste of it with little water. Now add butter in the kadai, masala paste and all the dry masala powder(chilli,coriander,cumin,turmeric and garam masala) Add 1/2cup of water, salt, coriander leaves and paneer cubes. 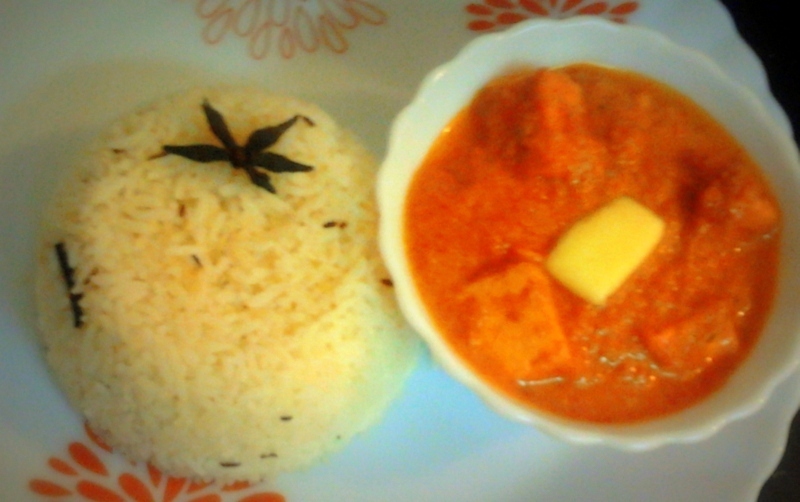 Cook the curry on low flame for another 10 mins and add fresh cream when ready to serve. 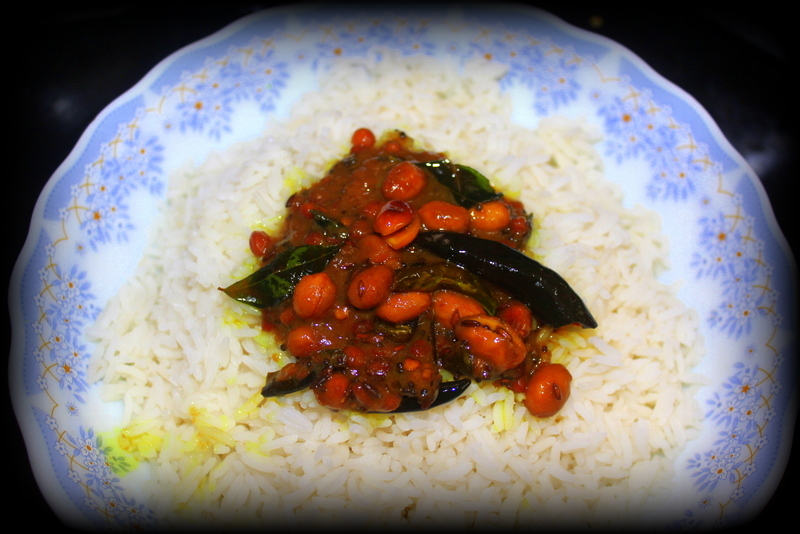 Serve hot with Roti or Jeera rice! I have never been a fan of beerakaya, some vegetables are not very appealing to look at. But if you cook them in a certain way you can enjoy eating them. I am big fan of chutneys, any chutney with plain rice is a yummy way to start the meal. This chutney is pretty easy and doesn’t take a lot of time. Wash and cut beerakaya into small pieces with skin. 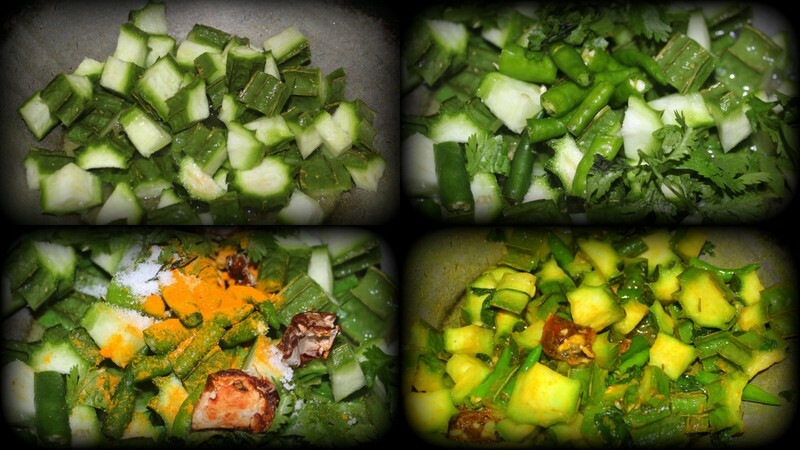 In a kadai add oil and the chopped beerakaya and green chillies. Add turmeric powder and tamarind and let them fry for few minutes until they turn soft and tender. Turn off the stove and let it cool. In the meanwhile start preparing tadka in a small kadai. Add all the ingreditents under tampering and keep it aside. For any pickle always add tampering after it cools off, this will make the pickle stay fresh for longer time. In a mixer jar add the cooked beerakaya, garlic, cumin seeds, salt and make a fine paste without adding water. Take it into a bowl and add the tampering. 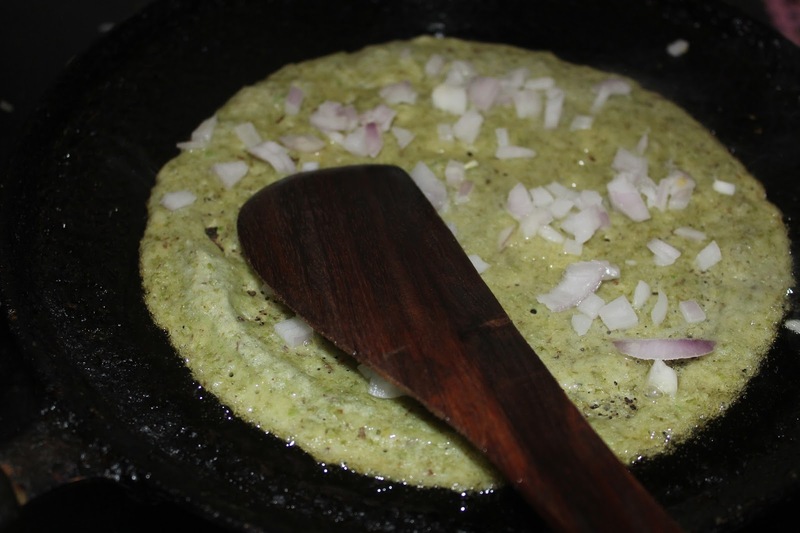 Serve it with hot ghee rice and papad! !There are lot of variation for this chutney. You can make it with skin, without the skin and also with just the skin. 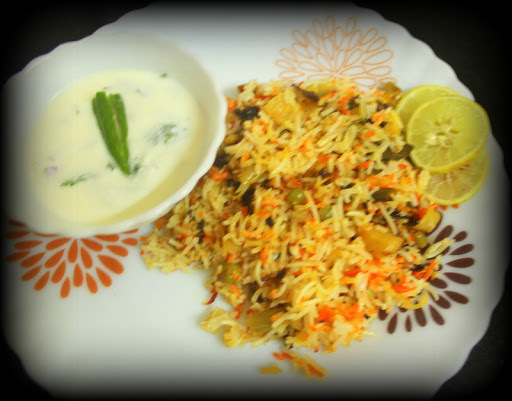 Soak basmati rice for 30 mins, drain the water and keep aside. Fry half of the onions in oil until they turn golden brown. 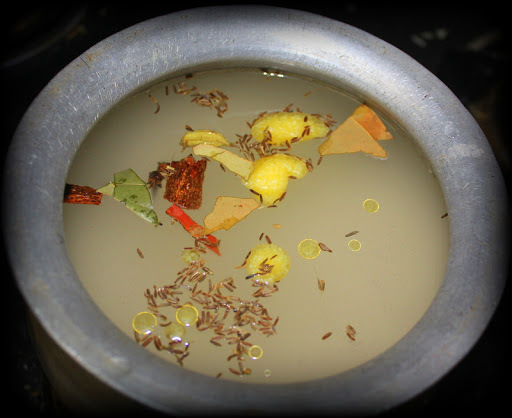 In a vessel, cook rice with 1 clove, cardamon, 1/2 inch cinnamon,1 bay leaf, salt. Pour some ghee on top and let the rice cook until its half done. In a big handi add oil with grounded cumin,cloves, cardamon and cinnamon and when they start to splutter add onions, green chillies and fry them for few minutes. Add the veggies, ginger garlic paste, turmeric powder, chilli powder, salt, mint, coriander leaves and cook them for few minutes covered with a lid. 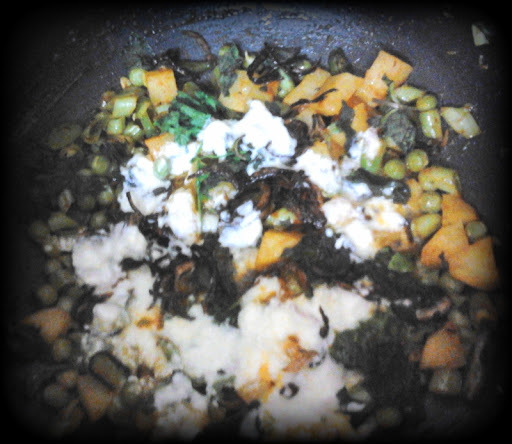 Once the oil starts separting from veggies, add curd and the fried onions. 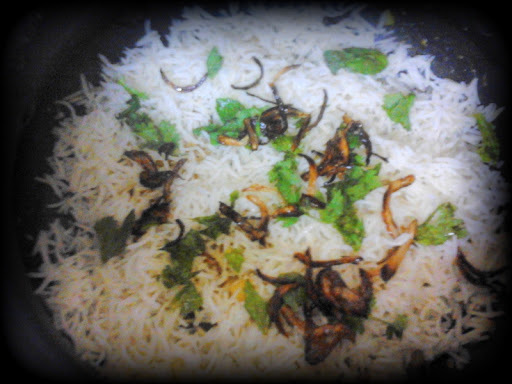 Now add the half cooked rice as first layer, on top add left over fired onions, mint & coriander leaves. Spread the 2nd layer of the rice and sprinkle some lemon juice, ghee. 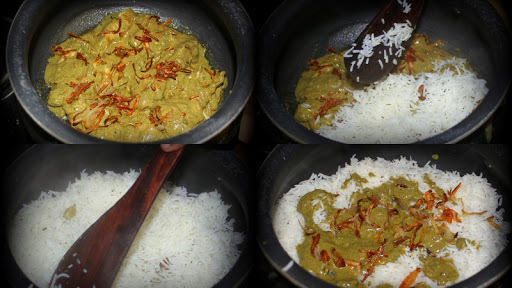 Mix few saffron sticks in milk and spread it over the rice. Cover it with lid and cook it on low flame for 15 minutes and keep rotating the vessel around so as to heat the whole vessel evenly. In some time you will see steam coming out of the vessel, turn of the stove. 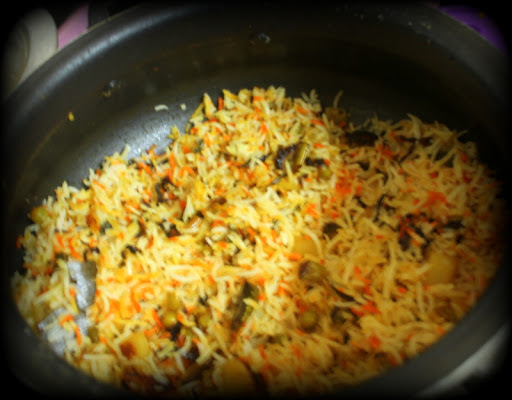 Turn of the stove and mix the biryani well with a flat spatula. 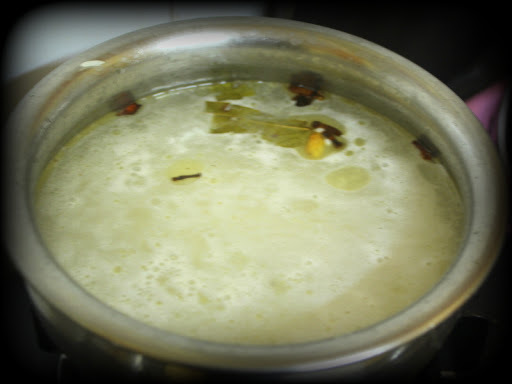 Serve hot with onion raita or any gravy! 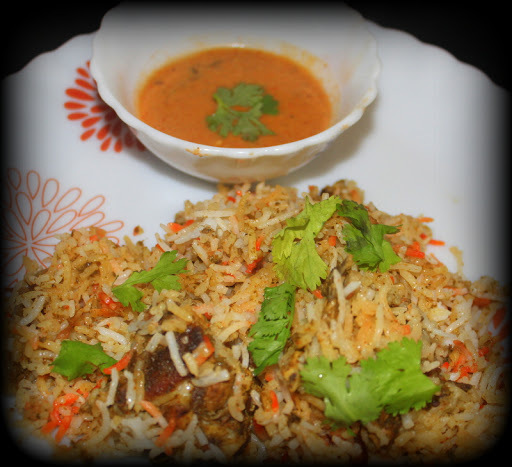 Best biryani in the world is probably the way the hyderabadi’s make it. Its our pride, and we cant get it wrong! 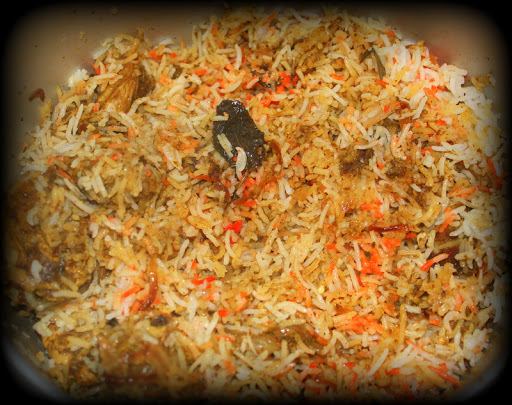 Lot of people think making biryani is a lenghty process and takes a lot of time. 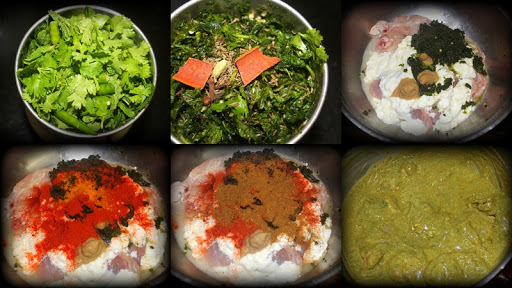 Actually if you have all the ingredients ready it would take just an hour to make chicken/veg biryani. Secret of making a good dum biryani is using the right vessel/kadai to make it. I use a handi I bought from prestige in which we can cook for about 4 to 5 people. Wrong vessel can burn the biryani or overcook chicken. 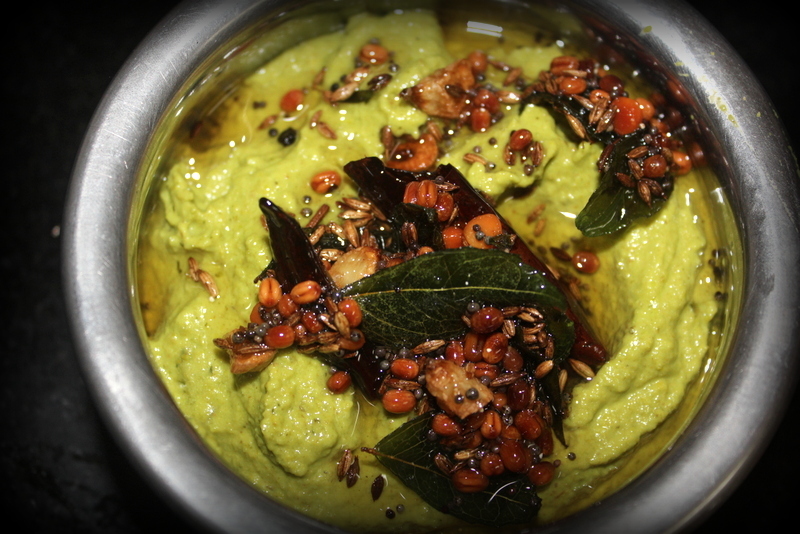 Grind the mint leaves, coriander, green chillies with cloves, cardamon, cinamon, cumin seeds together to make a fine paste. 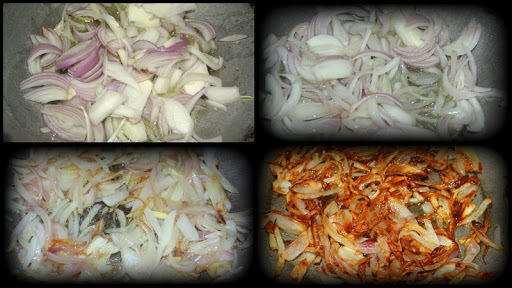 In a kadai add oil and chopped onions(long slit) and fry them until they turn into golden colour. keep checking them so they wont burn. Wash the chicken and add the masala paste, gg paste, turmeric powder, chilli powder, garam masala and half of the fired onion crushed, mix them all together. Cover it and let it marinate while you cook the rice. 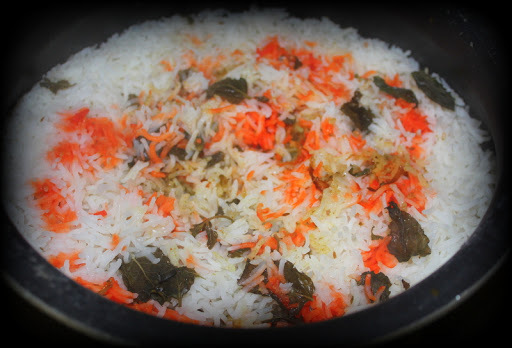 In a small vessel, put all the ingredients under making rice with water and add the basmati rice. Pour some ghee on top and let the rice cook until its half done. (Because we cook the rice on steam with the chicken we have to make sure rice is cooked only half so that it wont become gooey) Drain the excess water and keep it aside. Now in a handi spread the marinated chicken pieces, then the onions and spread rice evenly as first layer. 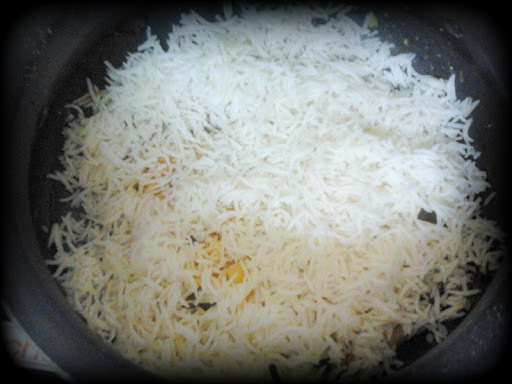 Now add the left over curd marination on the rice with the remaining fried onions and 2 tsp lemon juice. 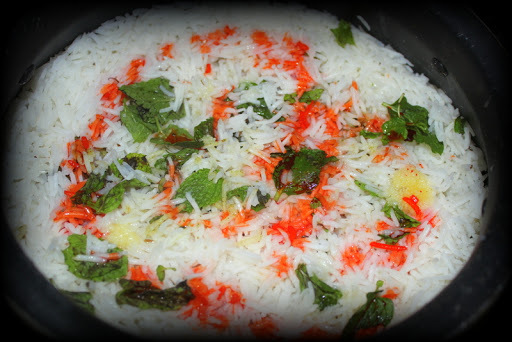 Spread the 2nd layer of the rice and sprinkle some mint leaves, coriander leaves, ghee, mix few saffron sticks in milk and spread it over the rice. Cover it with lid and cook it on high flame for 15 minutes and keep rotating the vessel around so as to heat the whole vessel evenly. Put the handi on a pan and cook on low flame for 15 minutes. In some time you will see steam coming out of the vessel, turn of the stove. 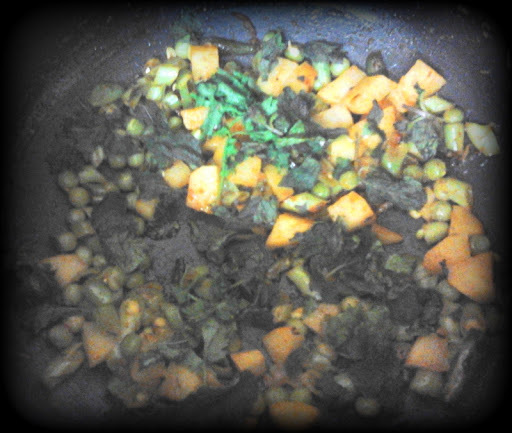 Garnish with some chopped coriander, and seve hot with any raita or the spicy mirchi ka salan!! 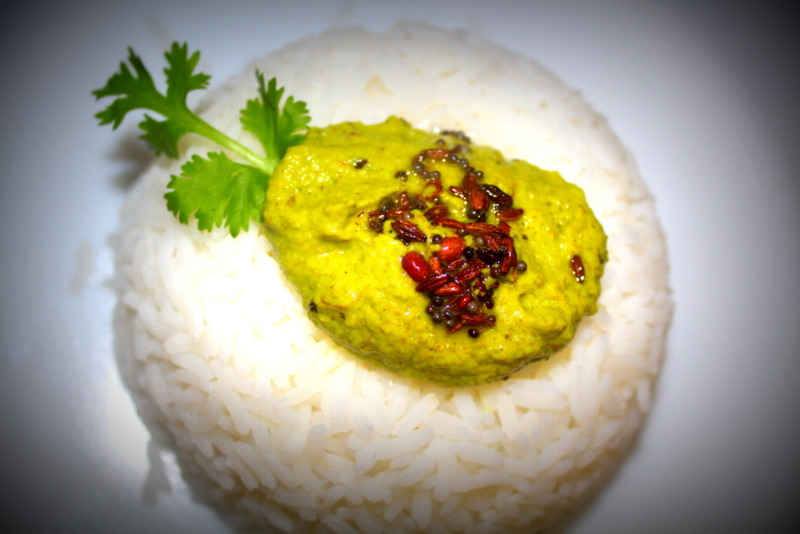 Soak the moong dal for 3 to 4 hours with raw rice. Drain the water and grind the dal with chillies, ginger and salt. 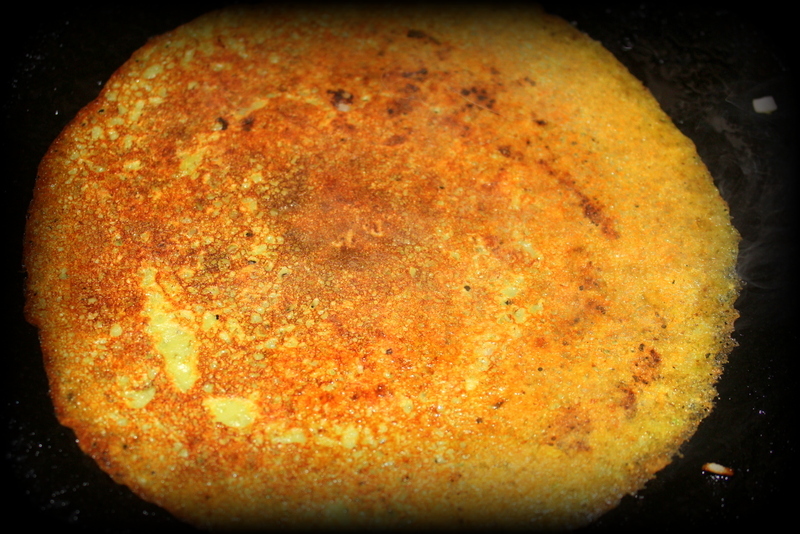 Adding raw rice makes the dosas crispy, I prefer these dosas more than the regular ones because this does not need to be fermented. 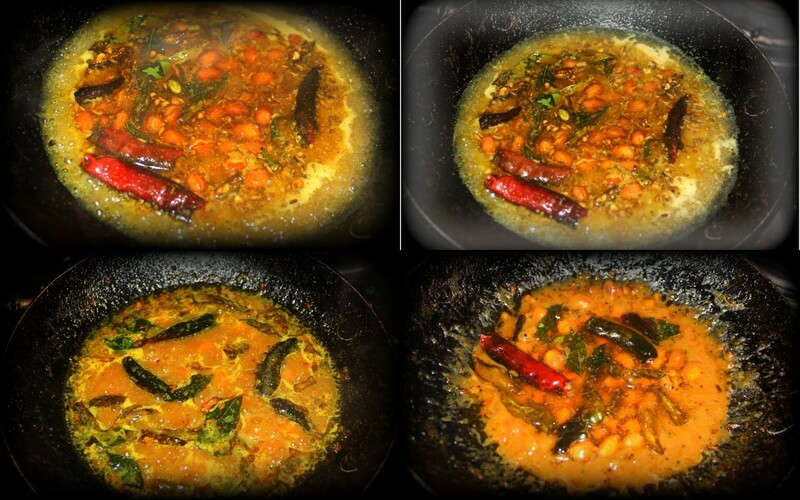 So you can soak the dal in the night and grind it in the morning, qucik and easy to make! Take a pan and heat it when it gets hot put a ladle full of batter and spread it evenly on the pan. 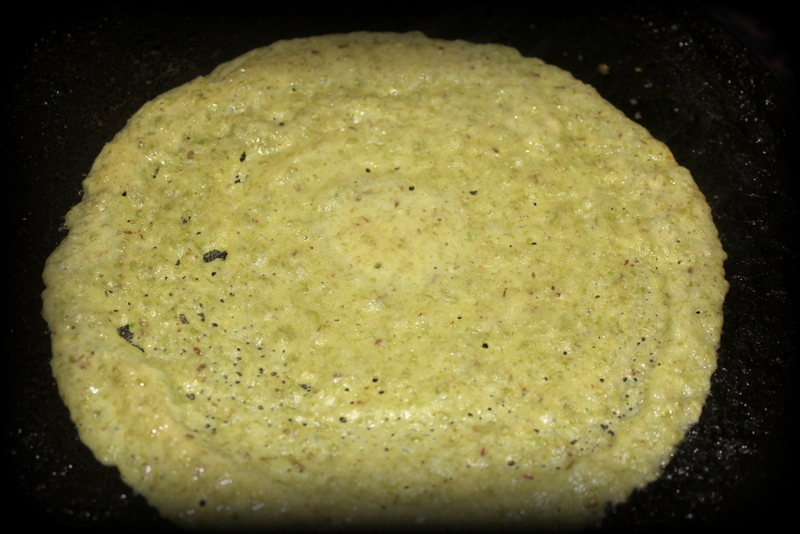 Now sprinkle the onions on top of dosa when the batter is still wet and slowly using a spatula tap the onions on the dosa. 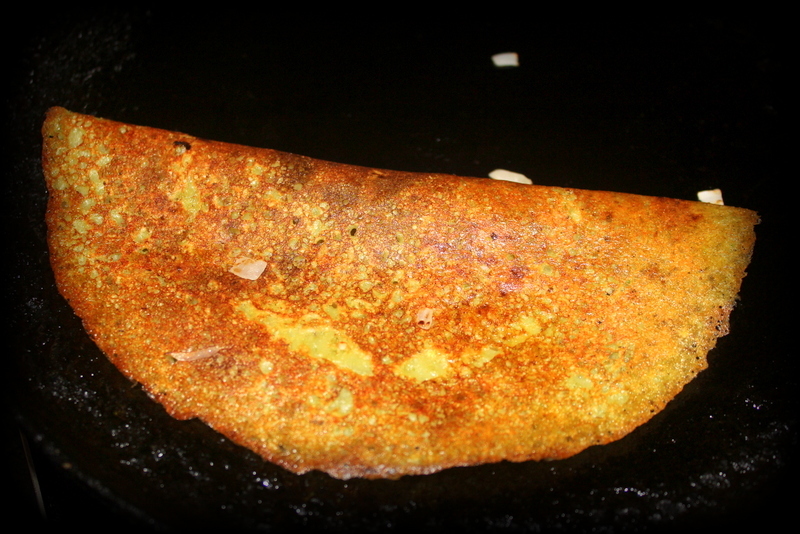 Now drizzle some oil and once the dosa changes colour flip it over the other side and cook till done. 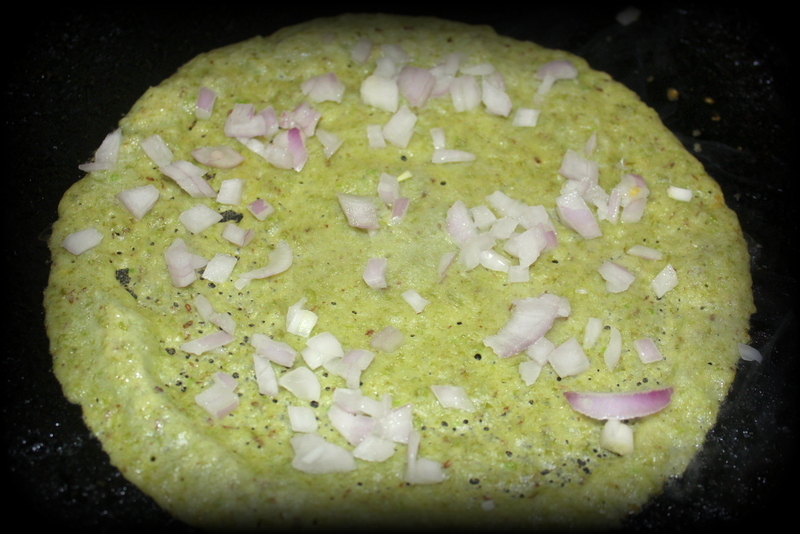 You can also add chopped green chillies and ginger on top of the dosa with onions. If you dont want your dosas to be crispy you can avoid using raw rice. In a small kadai, roast peanuts, onions, chillies and tamarind together.Once it cools off, grind them to make a fine paste with some water. Add water as per your desired consistency. 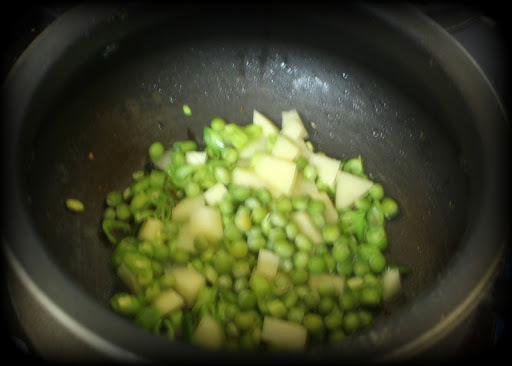 Now add all the ingredients under tempering in oil and pour it over the chutney and mix well together. Serve it with idlis or dosas!! To make it more spicier you can use red chillies instead of green chillies.